Juliana Francoise Anti-Acne Gel clear Arne and improve scars in 3 days. SKU: JFB09 Categories: Promotion, Acne & Blemish, Beauty, Facial, Rejuvenating Brands: Juliana Francoise. ‘ uliana Francoise Anti-Acne Gel has an exceptional composition of natural extracts that combats bacteria and fungi, controls the secretion of oil, and eliminates dead cells thereby encouraging new cell growth. 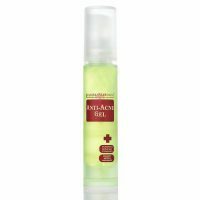 It has a soothing, healing and anti-inflammatory action. The physiological pH level allows it to soak immediately into the skin, acting all night. The effects can be seen within a few days of beginning treatment. Liposome Delivery System: Liposome are natural microscopic capsules that carry the active ingredients as deeply into the skin as necessary, releasing their contents in a continuous and controlled way, thereby ensuring the remarkable effectiveness. 14% Active Extracts: Juliana.Francoise guarantees that its products contain the largest concentration of active extracts available on the market and that is why they are more effective and produce better results. Hexagon Water, Glycerin, Citrus Medica Lmonum Extract, Laminaria Saccharina Extract, Panthenol Cucumis Sativus Fruit Extract, Melaleuca Alternipolia Leaf Oil Extract, Menthanol, Glycine Soja(Soybean) Protien, Oxido Reductases, Melissa Officinalis (Balm Mint) Leaf Extract, Castor Oil, Lavandula Angustifolia Oil Extract, Vit E.
Juliana Francoise Anti-Acne Gel formulation is a non-sticky, non-grasy hydrating gel with ultra-penetrative power. Use daily every morning and evening. 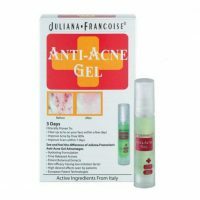 Apply a small amount of Juliana Francoise Anti-Acne Gel with your ring finger, gently tap around acne and blemishes areas.